Nevium’s analytical methodology identifies and evaluates the components of a brand. The Brand Score indicates the strengths and weaknesses of corporate or product brand, and provides a framework for improvements. The Brand Score is a factor in understanding the value of a brand and can be used to measure the changing contribution of brand assets over time. 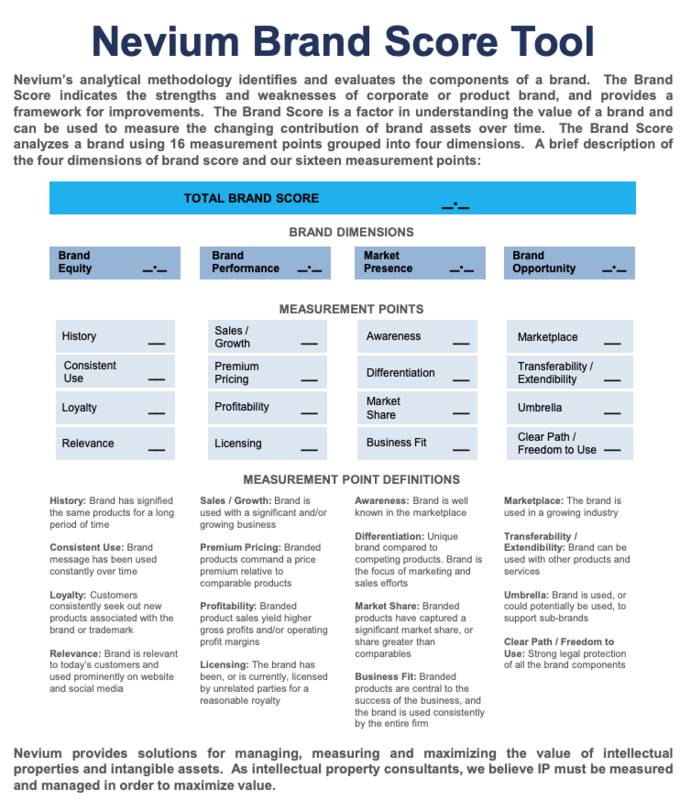 The Brand Score analyzes a brand using 16 measurement points grouped into four dimensions. Used in our valuation analyses and IP management projects, the Nevium Brand Score Tool allows brand owners and investors to focus on the relative strengths and weaknesses of the brand assets they are evaluating. Brand owners can focus their efforts on improving scores in one area, or exploiting the identified strengths of their brands. With these relative scores brands can be compared, and brand management can be analyzed over time.